Leukemia is a group of cancers caused by an abnormal production of undeveloped cells or leukocytes. This causes production of abnormal white blood cells which are not fully developed. Leukemia symptoms include bleeding, fatigability, bruising issues and increased risks to infection. The causes of leukemiaare still unknown as of this writing but it is certain that leukemia has many types and that each type may have different causes. And the causes may be environment and genetics related. Final diagnosis is made through blood tests and biopsy of the bone marrow. Survival rate of leukemia varies. Age, gender, race and the type of leukemia are all factors affecting its survival rate. But it's good to know that the overall survival rate from 2004 to 2010 significantly increased to 60.3% compared to the past years. During the 1960s, specifically from 1960-1963, the five year comparative survival rate among Caucasians was about 14%. And in the 1970s, from 1975 to 1977, survival rate was 34.2%. When doctors discuss cancer survival rate data, they normally use a specific number—5 year survival rate—which represents the percentage of leukemia patients who survived at least five years after they have been diagnosed with leukemia. It's the most common type of leukemia affecting adults, prevalent in older adults. It is a type of cancer that is known to be progressive or a cancer that develops little by little. CLL is commonly caused by an abnormal production and reproduction of abnormal or immature lymphocytes which is a type of white blood cells that grows and crowds the normal blood cells in the bone marrow. This crowding weakens the body's immune system, which makes it tough to combat body infection. Beginning in the bone marrow, it spreads into the blood slowly. It can also extend to other parts of the body like lymph nodes, liver and spleen. And since, it is a chronic type of leukemia, it may take years to develop and become severe. Chronic lymphocytic leukemia survival rate: According to College of American Pathologist, approximately 50% to 80% is the average survival rate of a person with CLL. In view of that, for the 10 year survival rate, there was a total 34.8% while the 5 year survival rate was at 60. 2%, according to the Journal Blood. This type of leukemia involved both blood and bone marrow. It's an acute type of cancer, meaning it develops very fast. It creates immature white blood cells causing the body’s defense mechanism to weaken very quickly. About 6,000 people are diagnosed with ALL based on the report by the University of Maryland Medical Center. 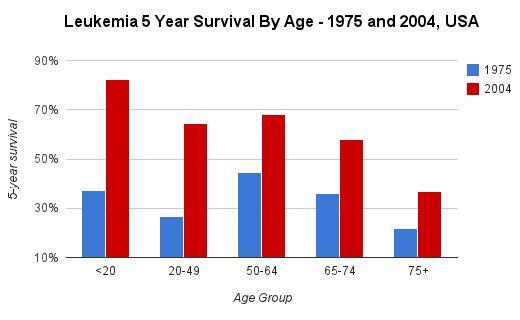 Acute lymphocytic leukemia survival rate: There is now 85% five year survival rate for children. Based on the report by American Cancer Society, about 80%-90% adults with acute lymphocytic leukemia experience remission after ALL treatment but about 50% will experience a deterioration which will significantly affect the overall cure rate. Just like any other type of leukemia, acute myeloid leukemia starts in the bone marrow. It’s a type of cancer involving the overproduction of immature myeloblasts. These immature cells, however, do not mature; they just keep on building up, crowding the bone marrow. Bleeding, bruising and fatigability are signs and symptoms of AML. Acute myeloid leukemia survival rate: There's about 25% five year survival rate for AML patients according to the University of Rochester Medical Center,which includes the most recently diagnosed as well as those cured AML patients. This type of cancer develops slowly; it creates abnormal cells and spreads through the blood gradually. What makes this type of cancer different is that it's usually asymptomatic for years. It is believed that CML is caused by tyrosine kinase—a type of protein produced by abnormal genes, which makes it a genetic disease. Chronic myeloid leukemia survival rate: According to the latest statistics, the five year survival rate for CML patients is 59%. The good news is that there are drugs these days that are being tested and developed to fight CML and because of this, the rate of survival are expected to be higher in the next few years. It's a subtype of chronic lymphocytic leukemia (CLL) that is very rare. It is caused by a large number of lymphocytes that develops very slowly. Using a microscope, this cell looks "hairy",that is how it was named. Hairy cell leukemia survival rate: According to a research from Cancer Researchers in UK, about 95% of patients diagnosed with hairy cell leukemia will live at least 10 years after diagnosis. Always remember that cancer statistics are only estimates gathered from data based on the diagnosed cancer patients in the US annually. Doctors can't be certain how long a person with leukemia can live. The statistics may not reveal the actual treatment or diagnosis result available. And these leukemia survival rates are just estimates. Where Does Colon Cancer Spread? Can You Get Mono Twice? What Should My Blood Sugar Be When I Wake Up?